This lovely book began as a stack of typewritten life stories collected over the years. This heartwarming little volume began as a stack of typewritten life stories that Michael Mazzarella had written over the years. His daughter hired us to create a book for him as a birthday surprise, and soon we received a box in the mail containing his stories and about a hundred original photographs. This family history book began with a (let's admit it, rather boring) "narrative report" automatically generated by a genealogy program. This family history book began with a (let's admit it, rather boring) "narrative report" automatically generated by a genealogy program. We added some additional stories, photos, and custom design to bring it to life for the family. A personal history doesn't have to been long or comprehensive. In this book, our client is refreshingly honest about some of his most meaningful experiences. 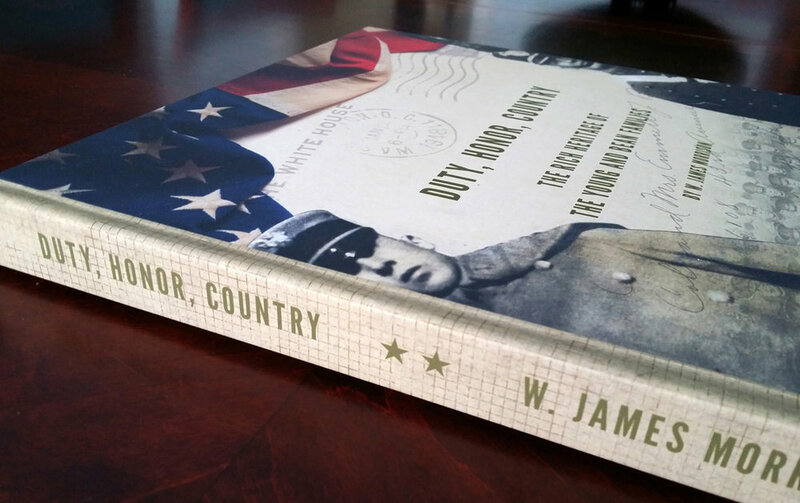 A stunning coffee-table book that tells the story of a multi-generational military family. When we first met Jim Morrison at the UGA Family History conference last April, he was interested in having us create a book about his wife's family. We were fascinated as he described some of the history his father-in-law, Robert "Rip" Young, a two-star brigadier general in the US Army.